Expert All-Mountain skis are designed for aggressive, proficient skiers who rip down groomers, float through powder and cut through trees. With some born from a GS mindset, they have the ability to deliver amplified performance in all snow conditions, allowing you to fully experience the mountain on their brilliantly comfortable ride—both on- and off-piste. These skis carve Eastern ice, bash bumps and soar the natural hidden hoodoo features in Coastal B.C. Versatility is their game, and they will take you wherever you want to go. Many of these skis rip groomers like a race ski, delivering superior edge grip and stability. They are also intended to provide all-round versatility for days when the snow is new and you want to buckle up and do the nasty. The Ski Canada Testers consistently pushed the limits of each ski in anticipation of a perfect “oh baby, I love you” performance. A word of caution: The selection in this category can vary widely, so you need to ask yourself where on the mountain you have the most fun. Then pick a ski to make that part of your life easy and fun. Surprisingly, when you do this the rest of the mountain opens up, becoming part of your regular white-fantasy experience. MEN: Tighten your bootstraps and let the good times roll with this amazingly playful ski that, as tester Erin Keam put it, “rips on the groomers and annihilates the soft bumps.” It was a bit of a stiffer ride on test day, requiring an extra fragment of energy for short turns, but the ski still delivered a smooth run in the rough stuff as well as the bumps. It’s ideal for the heavier, yet agile, expert, but even wee Mike Weiss found it “a great versatile ski because it manoeuvres so quickly in short turns, bumps and trees.” Its solid feel makes this a great carver that likes to be handled with power and authority. MEN & WOMEN: Testers found the X-Power 810 was happy and full of energy, providing a playful alternative for those seeking an effortless yet lively pocket rocket for charging into the steep hardpacked areas. Donie Blunden was spellbound as she devoured the run: “Wow! Short or long turns are fast—giddyup! It has solid performance through bumps and slalom carving on groomed.” Technical skiers will appreciate the progressive tip-to-tail flex, and how steady and solid the ski feels throughout the turn. Paul Cunnius commented on how the flex pattern promoted a “smooth linking of turns with little loss of performance or energy,” delivering that great blend of power and agility. MEN: Advanced and even intermediate skiers who enjoy mixing up their on-and off-piste adventures will find the Amphibio 88 a well-balanced solution for improving their skills. 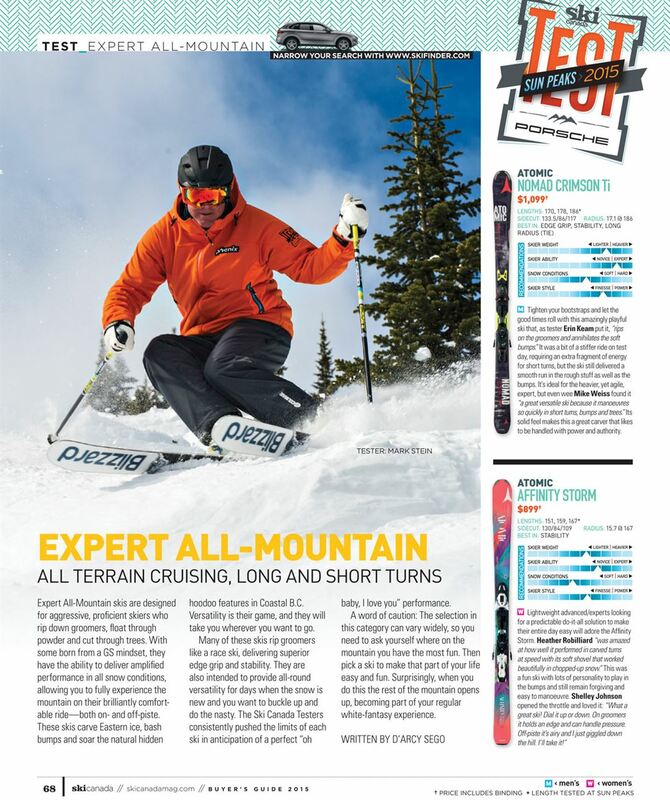 John Storey liked the “nice flex for bumps and crud, yet it’s stiff enough for big turns and the absorbing shovel makes bumps fun.” The ski was well behaved at moderate to fast speeds, but it’s not for the skier who has his foot on the gas all the time. Marc Ledoux found that “you can play with the mountain like a terrain park on this ski. 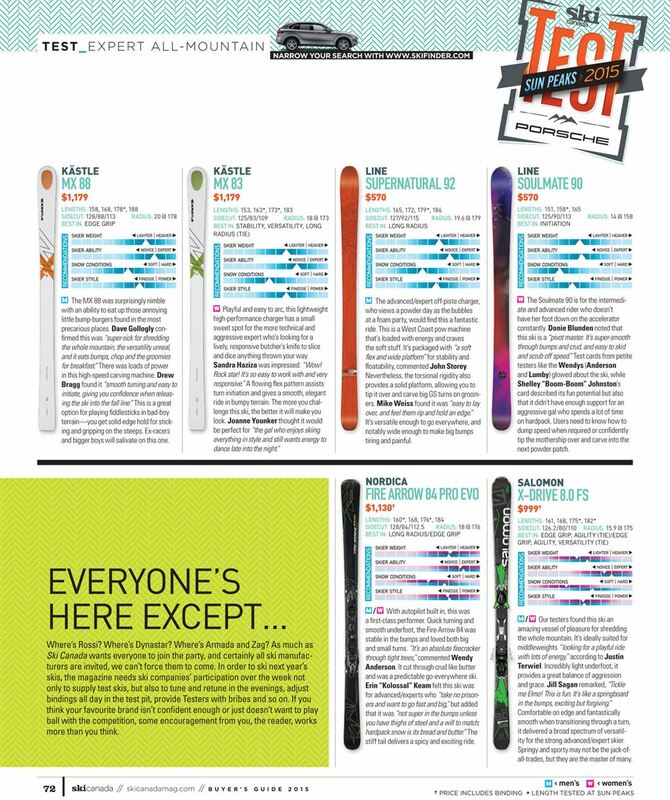 It’s quick and responsive with a light and agile feel.” The ski really shone in packed powder. WOMEN: Arc it or park it! Tester Wendy Anderson found the Interra a “beefy ski requiring power to drive. It carves well in larger turns, and is a big-pow, big-line ski.” There was a lot of attitude to let loose on this one, and Kathy Broderick noted that it’s “well-suited for the heavier skier. There’s a nice sweet spot that likes a lead foot on the gas to get things happening.” Once you’re flying and on edge, you’re able to hug the slope throughout the entire turn and feel incredibly stable, safe and centred. 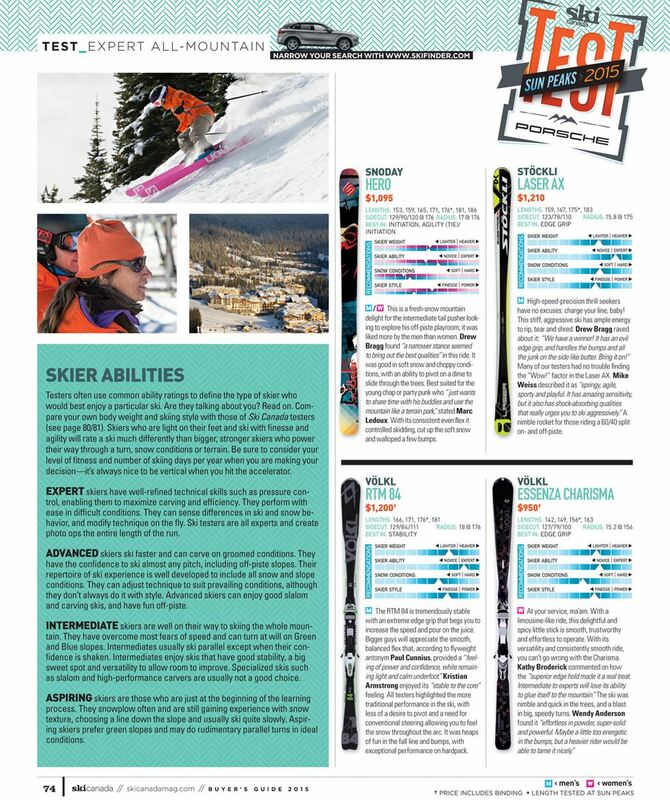 A powerful, aggressive operator who likes to rip was recommended for this ski. WOMEN: Strong intermediates looking for all-mountain fluidity will be motivated with this soft-snow adventurer. It was incredibly easy to steer and forgiving, with enough torsional rigidity for the heavier more aggressive riders to open it up, rip hard and have a lot of fun. Wendy Anderson found the Total Joy “surprisingly forgiving in bumps, with a large centred sweet spot” that provided confidence and stability. The consistent flex made it easy “to pull off some sweet turns where the snow was softer and the pitch was steeper,” according to Kathy Broderick. This ski would be lightweight and relaxing underfoot for a full day of cruising and exploring. WOMEN: A definite courage booster that can do anything anytime, the Potion 84 was “easy to ski and can hold an edge. It was quick and soft in the bumps, engaging nicely, and fun,” remarked Shelley Johnston. This smooth, stable and trustworthy ride performed equally well on a freshly groomed Sun Peaks run or in choppy, bumpy crud. It was light and zippy, and full of energy, which should help you impress your friends. This ski dispenses a go-anywhere attitude to put a smile on your face in any turn size and in all conditions. Jill Sagan noted that “an agile and athletic skier with a centred stance” will like this one best. MEN: The MX 88 was surprisingly nimble with an ability to eat up those annoying little bump-burgers found in the most precarious places. Dave Gollogly confirmed this was “super-sick for shredding the whole mountain, the versatility unreal, and it eats bumps, chop and the groomies for breakfast.” There was loads of power in this high-speed carving machine. Drew Bragg found it “smooth turning and easy to initiate, giving you confidence when releasing the ski into the fall line.” This is a great option for playing fiddlesticks in bad-boy terrain—you get solid edge hold for sticking and gripping on the steeps. Ex-racers and bigger boys will salivate on this one. MEN: The advanced/expert off-piste charger, who views a powder day as the bubbles at a foam party, would find this a fantastic ride. This is a West Coast pow machine that’s loaded with energy and craves the soft stuff. It’s packaged with “a soft flex and wide platform” for stability and floatability, commented John Storey. Nevertheless, the torsional rigidity also provides a solid platform, allowing you to tip it over and carve big GS turns on groomers. Mike Weiss found it was “easy to lay over, and feel them rip and hold an edge.” It’s versatile enough to go everywhere, and notably wide enough to make big bumps tiring and painful. WOMEN: The Soulmate 90 is for the intermediate and advanced rider who doesn’t have her foot down on the accelerator constantly. Donie Blunden noted that this ski is a “pivot master. It’s super-smooth through bumps and crud, and easy to skid and scrub off speed.” Test cards from petite testers like the Wendys (Anderson and Lumby) glowed about the ski, while Shelley “Boom-Boom” Johnston’s card described its fun potential but also that it didn’t have enough support for an aggressive gal who spends a lot of time on hardpack. Users need to know how to dump speed when required or confidently tip the mothership over and carve into the next powder patch. MEN & WOMEN: With autopilot built in, this was a first-class performer. Quick turning and smooth underfoot, the Fire Arrow 84 was stable in the bumps and loved both big and small turns. “It’s an absolute firecracker through tight trees,” commented Wendy Anderson. It cut through crud like butter and was a predictable go-everywhere ski. Erin “Kolossal” Keam felt this ski was for advanced/experts who “take no prisoners and want to go fast and big,” but added that it was “not super in the bumps unless you have thighs of steel and a will to match; hardpack snow is its bread and butter.” The stiff tail delivers a spicy and exciting ride. MEN & WOMEN Our testers found this ski an amazing vessel of pleasure for shredding the whole mountain. It’s ideally suited for middleweights “looking for a playful ride with lots of energy,” according to Justin Terwiel. Incredibly light underfoot, it provides a great balance of aggression and grace. Jill Sagan remarked, “Tickle me Elmo! This is fun. 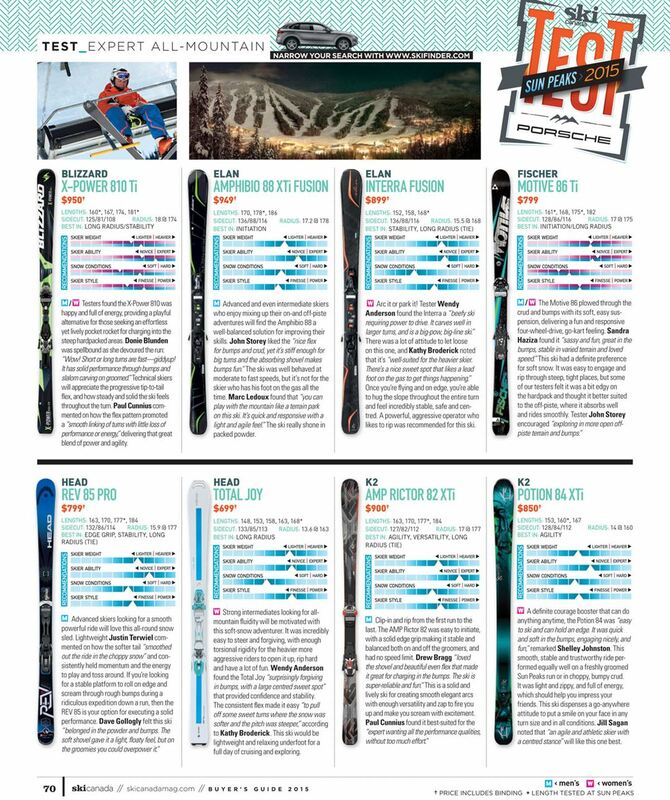 It’s like a springboard in the bumps, exciting but forgiving.” Comfortable on edge and fantastically smooth when transitioning through a turn, it delivered a broad spectrum of versatility for the strong advanced/expert skier. Springy and sporty may not be the jack-of-all-trades, but they are the master of many. MEN & WOMEN This is a fresh-snow mountain delight for the intermediate tail pusher looking to explore his off-piste playroom; it was liked more by the men than women. Drew Bragg found “a narrower stance seemed to bring out the best qualities” in this ride. It was good in soft snow and choppy conditions, with an ability to pivot on a dime to slide through the trees. Best suited for the young chap or party punk who “just wants to share time with his buddies and use the mountain like a terrain park,” stated Marc Ledoux. With its consistent even flex it controlled skidding, cut up the soft snow and walloped a few bumps. MEN: High-speed-precision thrill seekers have no excuses: charge your line, baby! This stiff, aggressive ski has ample energy to rip, tear and shred. Drew Bragg raved about it: “We have a winner! It has an evil edge grip, and handles the bumps and all the junk on the side like butter. Bring it on!” Many of our testers had no trouble finding the “Wow!” factor in the Laser AX. Mike Weiss described it as “springy, agile, sporty and playful. It has amazing sensitivity, but it also has shock-absorbing qualities that really urges you to ski aggressively.” A nimble rocket for those riding a 60/40 split on- and off-piste. MEN: The RTM 84 is tremendously stable with an extreme edge grip that begs you to increase the speed and pour on the juice. Bigger guys will appreciate the smooth, balanced flex that, according to flyweight antonym Paul Cunnius, provided a “feeling of power and confidence, while remaining light and calm underfoot.”Kristian Armstrong enjoyed its “stable to the core” feeling. All testers highlighted the more traditional performance in the ski, with less of a desire to pivot and a need for conventional steering allowing you to feel the snow throughout the arc. It was heaps of fun in the fall line and bumps, with exceptional performance on hardpack. Where’s Rossi? Where’s Dynastar? Where’s Armada and Zag? As much as Ski Canada wants everyone to join the party, and certainly all ski manufacturers are invited, we can’t force them to come. 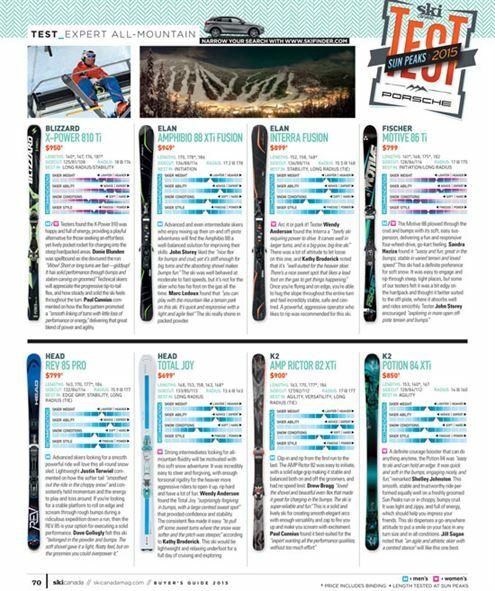 In order to ski next year’s skis, the magazine needs ski companies’ participation over the week not only to supply test skis, but also to tune and retune in the evenings, adjust bindings all day in the test pit, provide Testers with bribes and so on. If you think your favourite brand isn’t confident enough or just doesn’t want to play ball with the competition, some encouragement from you, the reader, works more than you think.